Volvo finally showed off the 2017 V90 in all its glory today, and there was much rejoicing in Wagon Fetish Land. The harsh reality is almost none of you cheapskates are actually going to buy it. That is why Kia needs to bring us this sweet Optima wagon. Whenever we get graced with a wagon here in America, you can bet that the extra cargo area is going to cost you. BMW puts a $2,300 premium on the wagon version of the 328i, and Volvo makes you pony up $2,000 for the V60 over the S60. While pricing on the Volvo S90 sedan hasn’t been released yet, a starting price in the mid-high $40k range is probably a safe estimate. Enthusiasts who are also wagon nuts notoriously don’t put their money where their mouths are. This probably because their desire for more wagons is not matched by their ability to make the loan or lease payments, or that there’s just not many of us to begin with. So what if I told you that it may be possible to get a turbocharged sport wagon, brand new, for around $30,000? Would you be interested? Meet the new Kia Optima wagon! It almost makes up for those terrible commercials with Christopher Walken. As of now, it’s for Europe only, but you folks need to be sending emails to Kia to bring this sucker to the States. 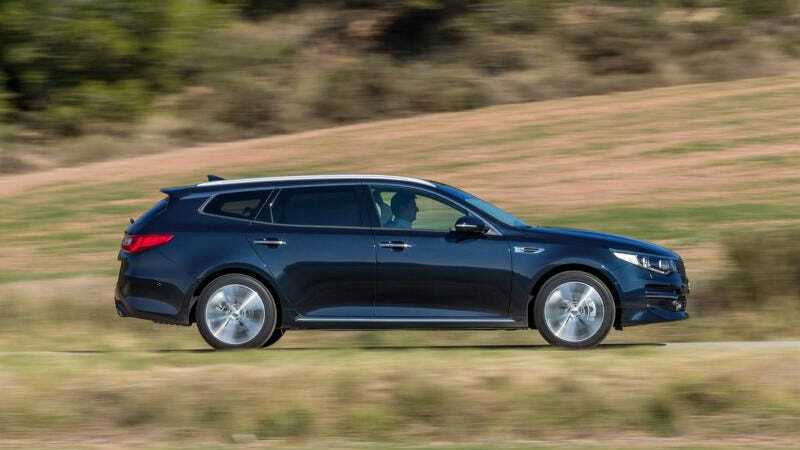 The Kia may not be in the same performance league as the European sport wagons, but hear me out. The 2016 Kia Optima SX has a starting price of $30,640 and comes with a turbocharged four-cylinder that puts out 245 horsepower and 260 ft-lbs of torque. It will get to 60 mph in under six seconds. This puts it on par with the BMW 328i in terms of passing power. At that price, Kia is also nice enough to throw in heated leather seats, voice command navigation, 18" wheels, rear camera, dynamic HID lights and “high-performance dampers.” The Optima probably won’t feel the same as the 3 Series, and you have to make do with front-wheel drive, but a comparably-equipped BMW wagon would set you back about $51,000. Is the BMW better? Sure. But is it $20,000 better? The point is that it is wonderful you all are excited about the V90. But instead of waiting patiently for one to show up at CarMax in a few years, why don’t we encourage Kia to give us a long roof that most of us could actually afford?